Degustation is the most recent of Jack Lamb’s East Village ventures and is located just next to Jewel Bako, his Japanese restaurant (and is only a stone’s throw away from JLOB, his third restaurant). As with JLOB, the idea at Degustation is to deliver fine dining in small tasting portions, permitting the diner to try many different creations at good value for money. The spotlight is on young chef Wesley Genovart who was raised both in Spain (Mallorca) and in California and also spent time both in Spanish and American kitchen (He worked in the Basque country, in Boston with Ken Oringer at Clio and at Jean-Georges Vongerichten’s Perry St). And both cuisines, Spanish as well as American are clearly seizable at Degusation. 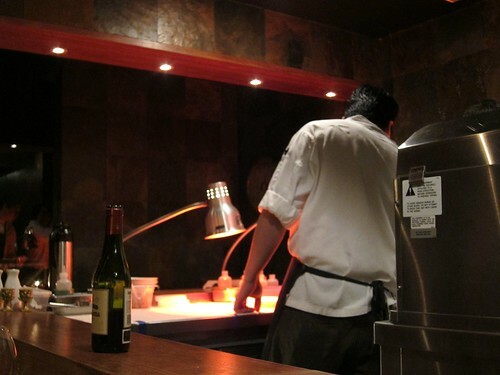 Thus it is also no surprise that as in a Spanish Tapas Bar, one is seated at a counter surrounding the kitchen. 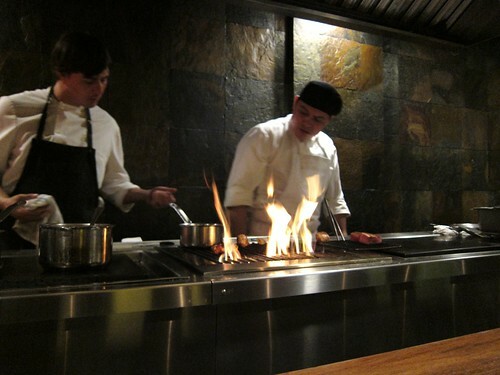 This creates an intimate and fascinating atmosphere as you can directly observe creative chefs at work. 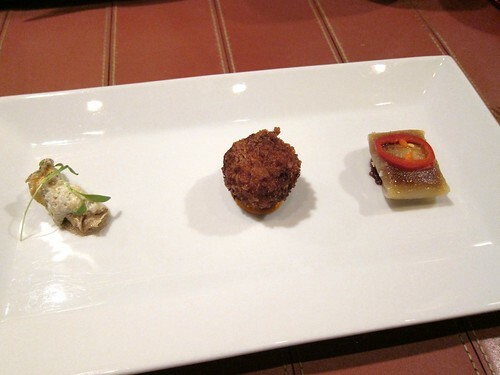 Fried Cod Skin, Croqueta, Tortilla with quail egg and shallot confit. The Crunchy and zested Cod Skin had a nice saltiness that woke up our palate. The croqueta was delicious, filled with pear and warm, melting cheese – a good contrast to the Cod Skin. The Spanish Tortilla was a one biter with sweet shallots exploding on your palate as you bite in it as well as a nice punch of spiciness. Those 3 bites were a good kick starter for this dinner that brought our papilles standing to attention. Crudo of Hamachi of very good quality served with fried pita bread. The preparation of the hamachi was one that didn’t overpower the fish’s own fine and subtle aroma. BYO White wine. Thanks a lot Toby! 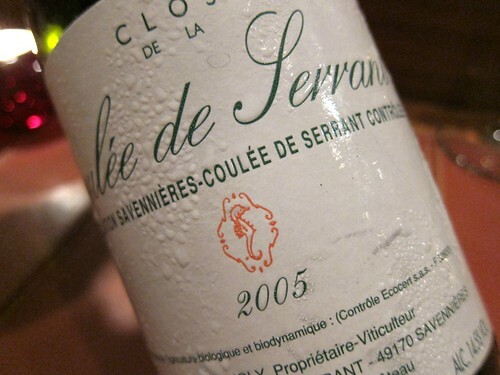 2005 Coulée de Serrant is a fascinating wine with great minerality and a superb acidity. Hard to describe, but the impression of a complex wine that is yet clean and crystal clear comes to my mind. Sunchoke Soup, Sea Urchin Roe, Apple, Tarragon. Richness is the prevailing idea here. 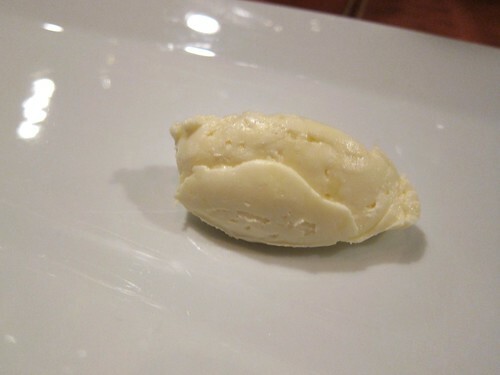 A dish with heart- and soulwarming creaminess but yet creative and well thought. 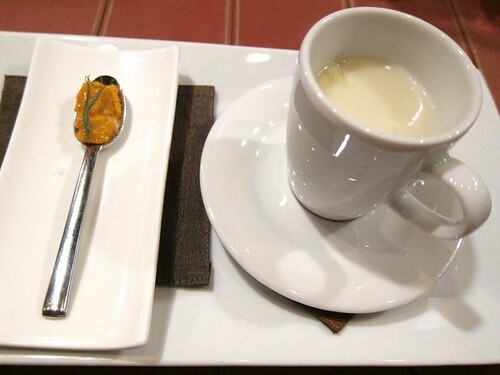 The rich sunchoke soup got even richer with the Uni, but the tiny apple bits set acidic counterpoints. Grilled Octopus, Potato, Fennel, Caper Berries. 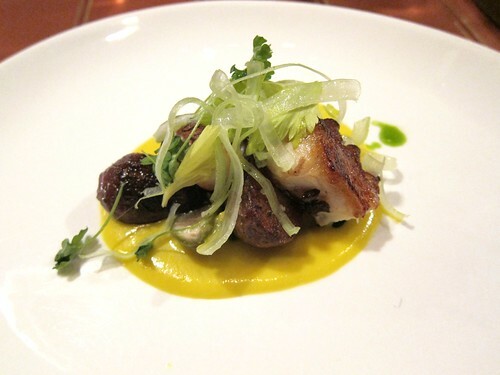 Who doesn’t like tender octopus with charred crunch to it? A take on Phillie Cheesesteak, but as a luxury version using Wagyu beef. Very nice texture with a nice crunch underneath the meat – I think it came from a toasted piece of bread. 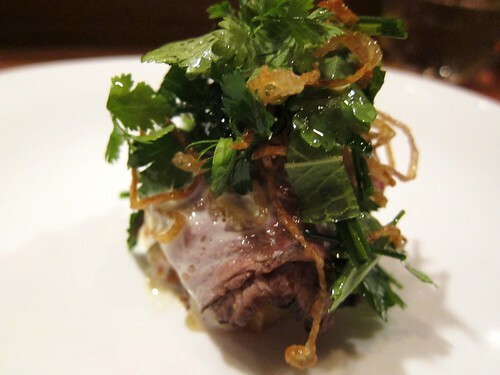 Freshness emanated from the herb salad on top of the Wagyu. The beef itself was filled with liquid cheese. My only little critique would be that the dish wasn’t really hot anymore, but I guess it was me taking too much time with the previous dish. Conejo. 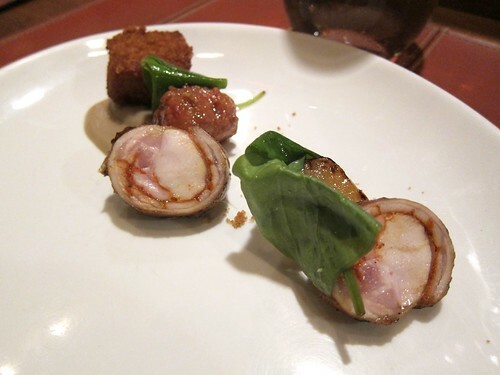 Rabbit 3 ways. Really liked the hearty rabbit meatball in the middle which was very intensely spiced! Our half bottle of red, a Rioja Alta Vina Ardanza Reserva 2000. 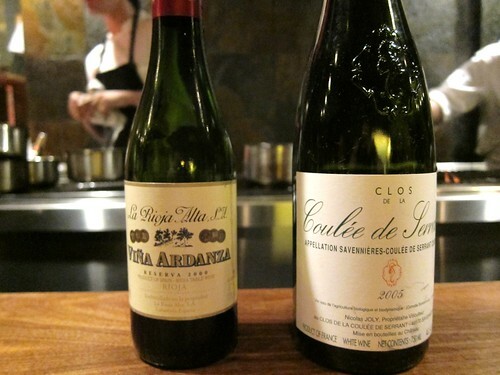 The winelist features a small but good selection of Spanish wines, but only a few in the lower pricerange. 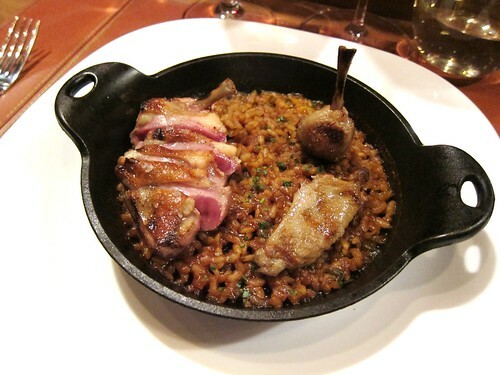 Quail on “dirty rice”. Another winner. Subtelty came from the delicious quail meat which has class and elegance, but is still flavourful enough to deal with this intense rice. Lamb loin, heirloom cauliflower, pine nut purée, pickled raisins, mint. Perfectly cooked lamb; both quail and lamb were excellent matches with the Rioja Alta. Dessert was this Spanish version of French toast. 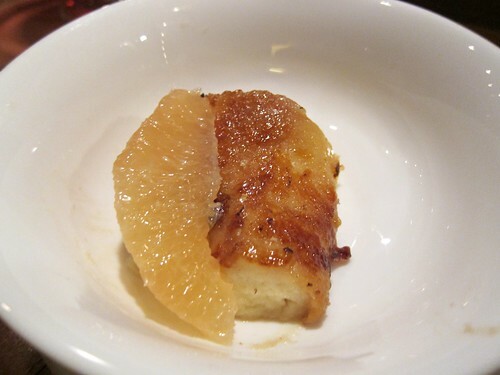 A Brioche which was infused with cream and seared, then also soaked with citrus aroma and paired with a slice of grapefruit. Actually one of the most simple desserts in the world but elevated to another level with clever modifications. Simply Delicious! 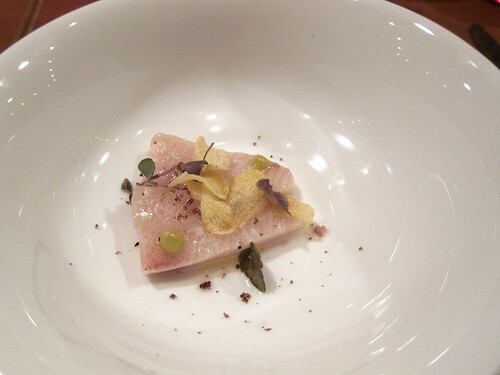 At 50$ for a five course tasting and 75$ for a ten course tasting menu, Wesley Genovart delivers dishes that were always of excellent ingredient quality, and sometimes describing his great talent and creativity. 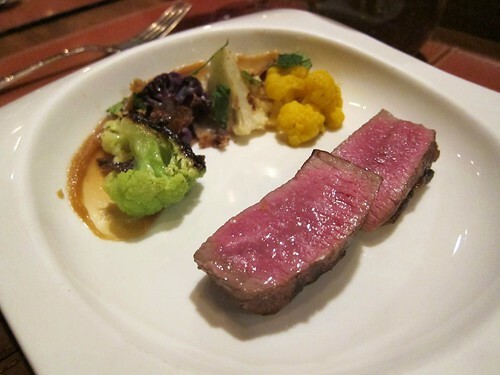 Some dishes like the lamb loin were simply well executed and solid, others like the one-bite-Tortilla, the Sunchoke Soup or the dessert were of great inspiration. Simply great value for money and a chef to watch.